The Fed’s decision to initiate another phase of quantitative easing bodes well for the economy over the next six to nine months.Anticipation of the move drove down interest rates ahead of the official announcement, and by delivering on expectations, the Fed engineered at least several months of sustained low interest rates by purchasing $600 billion in U.S. Treasuries and reinvesting principal payments from its mortgage-related holdings into long-term Treasuries. The primary goals of Quantitative Easing 2 (QE2) are to spur corporate investment and foster consumption and asset purchases within a low-interest-rate environment. QE2 is also, in part, a reaction to deflation concerns stemming from consumer price increases of just 1.1 percent over the past 12 months, short of the Fed target of an estimated 2 percent. QE2 will pressure the U.S. dollar, which has fallen roughly 7.5 percent since early June. This will boost commodity prices and U.S. exports and encourage foreign holders of U.S. debt to purchase more Treasuries. Exports account for approximately 12.5 percent of the U.S. economy and remain crucial to expansion at a time when housing, typically a supporter of growth after recessions, continues to drag. QE2 comes at a critical stage for the economy, as the impact of other government stimulus is fading and the private sector has only begun to take the reins of the still-fragile recovery. The latest move follows the Fed’s initial round of quantitative easing, which began in late 2008 and included combined purchases of $1.75 trillion of GSE direct obligations, mortgage-backed securities and Treasuries. The Fed’s decision to proceed with QE2 followed the release of third quarter GDP, which confirmed the economy’s shift into neutral. The estimated annualized gain of 2 percent during the quarter remained well below the long-term average of 2.9 percent and falls short of levels necessary to drive down unemployment. During the third quarter, the trade gap widened as imports increased at a faster clip than exports, shaving two full percentage points off the headline rate of growth. QE2’s devaluation of the dollar should result in stronger demand for U.S. goods from overseas, narrowing the trade deficit and boosting overall economic expansion. One day after the announcement of QE2, stocks surged and the yield on the 10-year Treasury declined. While lower interest rates should result in stronger growth for corporate America, which has already benefited from a significant turnaround in lending since the financial crisis, small to mid-sized businesses will continue to encounter challenges securing credit due to stringent lending requirements. Lower interest rates also will have a limited impact on the housing market, as tight underwriting standards and elevated risk aversion among lenders remain significant hurdles for potential homebuyers, and fears of additional price correction continue to deter purchases among qualified individuals. Commercial real estate has become increasingly attractive. Occupancy declines have subsided in most sectors, apartments have staged an early recovery, and the spread between interest rates and returns has widened, a trend QE2 should reinforce. As of third quarter, the gap between the average cap rate across core property sectors (including apartment, retail, office and industrial) and the 10-year Treasury had increased to 560 basis points, up from just 220 basis points at the market’s peak in 2006. QE2’s anticipated influence on overall economic growth also should enhance property values and investors’ perception of commercial real estate, as increased trade and stronger job growth will support occupancy gains and the resumption of rent growth. There are potential negative consequences of QE2 that should not be overlooked. If elevated liquidity and accelerating growth drive up consumer prices sharply over the next 12 to 18 months, the Fed may have to quickly reverse course, potentially leading to a sharp slowdown in the pace of recovery. QE2 could also result in a miniature asset bubble by way of increased speculation. At this stage of the cycle, however, fueling greater economic growth outweighs the risks. 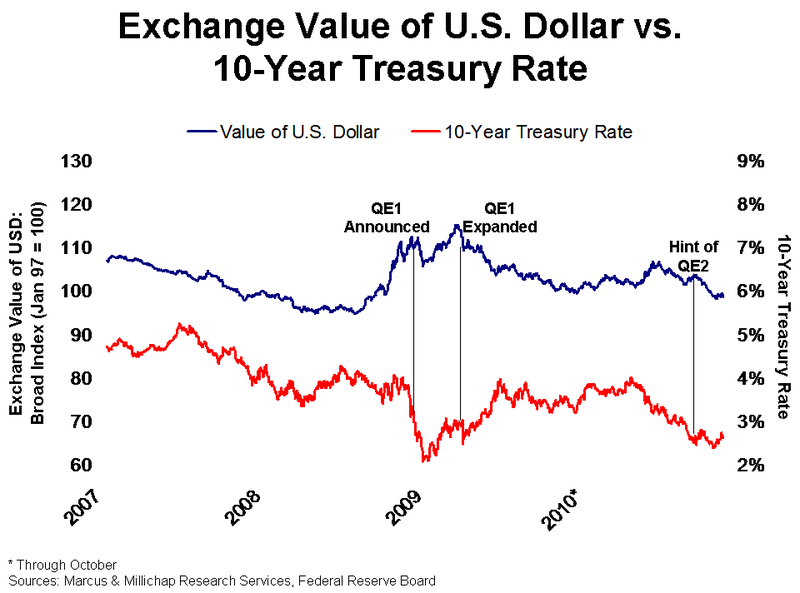 This entry was written by marcusmillichap, posted on November 6, 2010 at 12:38 am, filed under Research and tagged Exchange Value of U.S. Dollar VS 10-Year Treasury Rate. Bookmark the permalink. Follow any comments here with the RSS feed for this post. Trackbacks are closed, but you can post a comment. The author forgets that foreigners have NO inscentive to buy our treasury bonds…as a matter of FACT there are no buyers that is why the FED is buying the printed money. This may be good for some investors but the middle class may not be able to afford the rents as soon as the dollar falls and commodities rise. After paying for food and energy, that is NOT factored int the inflation numbers there will be little left for rents. Awesome Web-site, Preserve the fantastic job.